Merthyr winger Kerry Morgan. Pic: Peter Harman. Football pundit Steve Claridge, who played for 25 different clubs during a career which lasted more than two decades, has praised Merthyr Town. Claridge, aged 52, is now manager of Salisbury, who defeated the Martyrs 2-0 in an Evo-stik South Premier League South. “Merthyr are the best team we’ve played this season,” said Claridge. A major turning point came when winger Kerry Morgan was sent off after clashing with home player Bay Downing – and they had Kyle Patten dismissed at a time when the home team were one goal ahead. Both players needed a lengthy spell of treatment and referee James Robinson had time to consider his options before both players were on their feet. It was Morgan who saw red and was sent off. Patten was sent off for a second bookable offence after referee James Robinson awarded a penalty for his foul with five minutes left. Salisbury scored their second goal from the spot. The defeat at the Ray Mac (Raymond McEnhill Stadium) was a blow for Merthyr, who dropped to sixth in the table with the home team moving about them. Beaconsfield Town provide the next test for the Martyrs when the teams clash at the MetCoaches Stadium on Saturday (3pm). Manager Gavin Williams’ Merthyr started in style and pushed Salisbury back with an impressive Kerry Morgan hitting a post after four minutes. Moments later the Welsh club found the home net, but that effort was disallowed for offside. A goalkeeping error, when Joe Perry saved a powerful drive by speedy winger Danny Young. But the Martyrs man could only parry the shot and Lewis Benson was left with a simple finish after five minutes. That was Perry’s first and final error of the and he turned on a man of the match performance for the Martyrs. Prolific goalscorer Tom Meechan found space soon after Salisbury went ahead, but his shot flew straight at Jake Hallett and he saved. Just before half-time Ian Traylor broke free of the home defence and went one-on-one with Hallett. The ‘keeper timed his run off his line to perfection to avert the danger and soon after he denied Meechan with a big save. The match was delicately balanced and both teams created chances. Meechan’s header was cleared off the line by Benson, while Morgan was sent off after 55 minutes to tip the balance firmly in Salisbury’s favour. Merthyr battled on with 10 players and Ian Traylor brought a flying save from Hallett when he fired a free-kick towards the top corner. 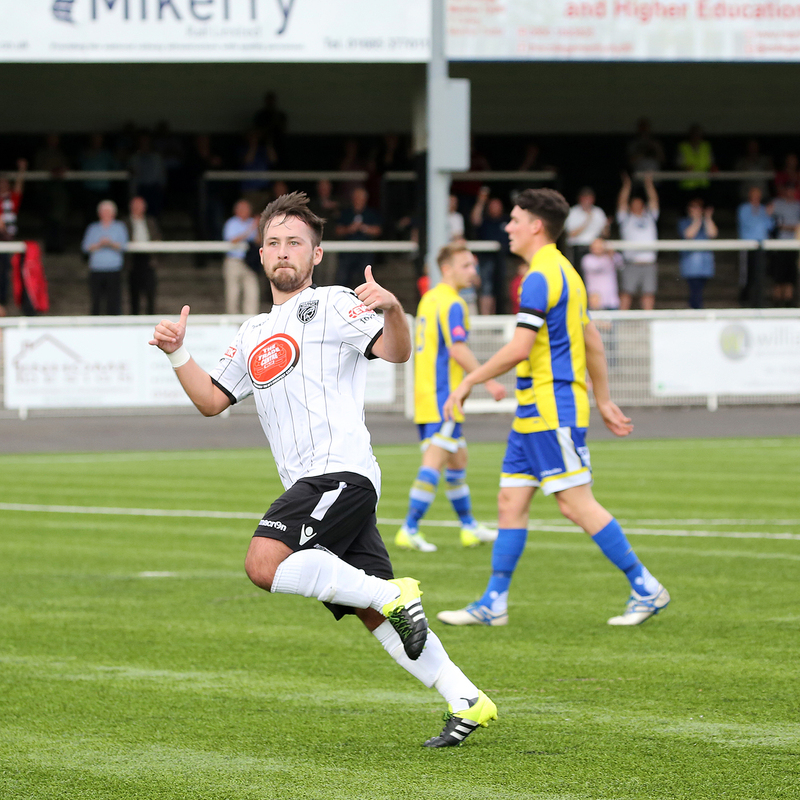 There is no question Merthyr deserved better than defeat, but their hopes just about disappeared when they conceded a penalty and were reduced to nine players. Dan Fitchett was the player fouled, Patten was shown red during the aftermath of that award and Fitchett fired home from the spot to complete a 2-0 win. Merthyr Town: Perry, Davies (McWilliams 80), Young, Evans, McDonnell, Patten, Lucas (Prosser 66), Wright (Lewis 80), Meechan, Morgan, Traylor. Subs not used: Harris, Hunt. Ticket prices for Saturday’s home fixture against Beaconsfield are £12 adults, £9 senior citizens and students, £1 for under-16s. Weymouth earned a midweek 2-1 win at fellow high-flying Tiverton Town and are four points clear at the top of Premier Division South. Defender Michael Landricombe’s 22nd minute goal give Tivvy an interval lead, while Jake McCarthy equalised on 66 minutes and then, a minute into stoppage time, Brandon Goodship popped up to grab the Weymouth’s winner. Taunton Town kept up the pressure on Weymouth in second when they won 2-1 away at Dorchester Town. Thaunton’s Peacocks, who face Vanarama National League South leaders Billericay Town in the Emirates FA Cup on Saturday, took the lead in the 19th minute when Craig Neal headed in. Dorchester equalised just after the half hour when Luke Winsper scored before Taunton regained the lead during first half injury time with Neal scoring from close range. Biggest winners of the night were Beaconsfield Town, who play Merthyr Town away on Saturday and hammered bottom club Chesham United 7-0 at Holloways Park. Tony Mendy scored a hat-trick in the opening 26 minutes, Charlie Lossaso bagged a second-half brace, with Bajram Pashaj and a Brendan Matthew penalty wrapping things up.